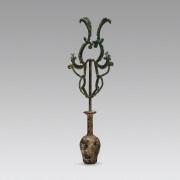 Datation : 12th century A.D., 13th century A.D. Categories: Animals, Ceramics, Vessels. Tag: Vessel Decorated with a Hare. 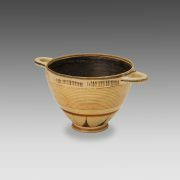 A circular vessel with a rounded profile, an inwardly rolled edge and a small disk-shaped, low foot. 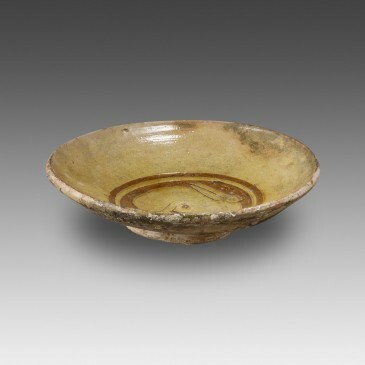 The inner surface is covered with a layer of pale yellow glaze. The medallion, with its brown background, is decorated in the “champlevé” technique: a thin carved line encircles and highlights the decorative pattern, which was first incised with a very fine point. The piece was then fired. The outside of the plate is not painted or decorated. The animal represented in the tondo is a hare (or a rabbit: artists did not make any difference between the two species). Displaying slightly naive proportions, the animal seems to be seated on its hind legs, stretching its forelegs in the typical attitude of rabbits; its hindquarters are disproportionate, its legs are thin stalks, its ears are placed on the back. Hares frequently appear in Christian imagery. Beyond their association with the egg in Easter iconography, as a symbol of fecundity and rebirth, these animals would have also had another meaning in the Christian beliefs: because of their lack of defense, hares would have incarnated the faithful Christian being able to trust God fully. 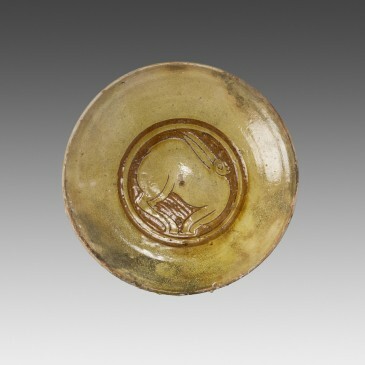 The technique of “champlevé” in ceramic decoration appeared in the Byzantine world circa the late 11th century. 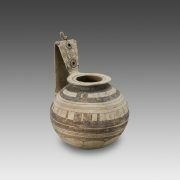 The vessels decorated with this method were widespread in the regions of the Mediterranean and of the Black Sea between the late 12th and the first half of the 13th century A.D.
12th century A.D., 13th century A.D. Complete and in good condition, minor chips. Surface partially burnt and concretions on the outside.